The Globe win could boost Mo’Nique’s prospects at the Academy Awards, whose nominations come out Feb. 2. “First let me say, thank you, God, for this amazing ride that you’re allowing me to go on,” the tearful Mo’Nique told the crowd. 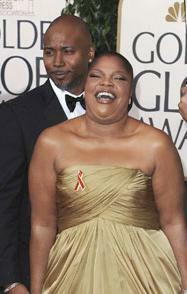 She went on with gushing praise for “Precious” director Lee Daniels and newcomer Gabourey Sidibe, a best dramatic actress nominee at the Globes with her first film role, playing Mo’Nique’s abused, illiterate daughter. I wonder can Mo’Nique play other roles, because this seem like an easy role for her, considering that she is quite loud. Why shows like the Insider act like Mo’Nique ain’t even win an award?? All the shine went to the white actresses. What tha is going on up in here? 🙂 I wanna know the same thing!!?? What’s up with the new layout??? Hopefully she is learning some level of grace as she appears to be a shoo-in for this award. I cannot get passed her inane statements to the press when “Soul Plane” came out that she had no problem w/the “n” word. She said much more than that demonstrating her organic ignorance. And then rumors circulate around her wanting to get “paid” for her appearances to promote “Precious”. Ridiculous. To Monique: “You now have a much more diverse and larger platform listening to you. No one expects you to be a rep for the entire black community. However, please be mindful of statements like what you made during the “Soul Plane” press junket…..they have long range effect….equally as important, congratulations”.